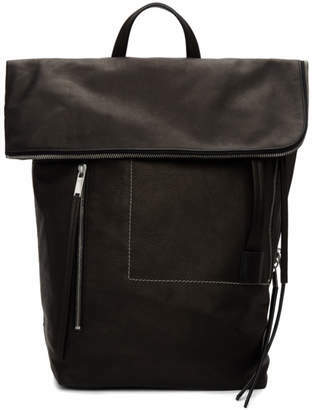 Grained calfskin backpack in black. Carry handle at top. Detachable shoulder strap with lanyard clasp fastening. Embossed logo, carry handle and zippered pockets at face. Two-way zip closure at main compartment. Patch pocket and expansion panel at interior. Textile lining in grey. Silver-tone hardware. Tonal and contrast stitching in white. Approx. 15.5 length x 24 height x 7.5 width.